I have long been fascinated by people who have regular practices. Henry Bucher, chaplain emeritus, has dedicated his life to service and mission—and has had some phenomenal experiences along the way. Elizabeth Kubacki ’13 shares thoughts about her life-changing summer in Nairobi, Kenya, as an Austin College GO Fellow. Steven Phillips ’13 combined a love of Australia with a love of photography in a summer study abroad program—with stunning results. Austin College has a mission of engagement and service in its hometown, thinking globally and acting locally to leave its mark upon the community. Austin College is seeking gifts to fund equipment needs in the soon-to-be completed IDEA Center. A challenge grant makes every gift worth more. 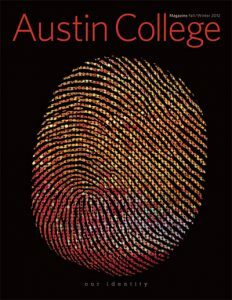 At Austin College, every gift makes a difference.